Nordic Arts is a favorite art supplier for Rosemaling artists (who are having trouble with those hard-to-find supplies) and for the general art community of Northern Colorado. Visit our order information page for items available from Nordic Arts! Here is a convenient list of supplies and helpful hints to get most painters started -- especially those using Diane's books to embark on and enhance their Rosemaling skills. Enjoy! Stabilo pencils--white and light blue, can be wiped off with water. Masking tape, blue painters tape in 1"
Scotch Magic Brand tape, 3/4"
JoSonja's Clear Glaze -- apply one coat over acrylic background colors for easier painting and easier paint removal. Improves the quality of your background for much easier painting or antiquing. All pieces in Diane's books were painted with Archival Oils. Although Diane uses acrylics for many things, her heirloom pieces are painted with oils. She prefers their translucency and the ease of application. Using the Archival Odorless Lean Medium speeds drying to almost overnight, and the Archival Odorless Mineral Spirits keep her Turp allergies totally at bay. You can order these from Nordic Arts. Equivalents in other brands are listed in parentheses. If you have problems with oils try Archival Mediums and Solvents. They are the best Diane has found and cause her no problems with allergies. Put solvent in a small jar with a cover and use fresh each time. Keep the cover on except when cleaning brushes. (Solvent fumes can give you headaches and fatigue, avoid breathing them. The ideal way to paint is to have a brush for each color and clean your brushes as infrequently as possible or when you are finished.) Archival Odorless Solvent is non-combustible and can even be transported on an airliner. If any supplies are not available in your area you may order them from Nordic Arts. A complete Color Conversion Chart is available from Chroma. www.chromaonline.com has free product info, updates and teacher listings -- it's a great resource. If you are painting transparently you can rub JS Retarder very lightly over your background and paint into it, or you can transparentize them slightly with a addition of JS Kleister Medium. Check wood for dark spots or knotholes and put on a coat of Tannin Sealer over these. Sand only if there are really rough spots on the piece. Otherwise, paint with one coat of JS background paint followed by a good sanding while pience is still cool to touch. Add JS Wood Filler now into any holes. This avoids inhalation of toxic sanding dust. If using JS paints add equal parts JS Sealer to the first coat of paint. Diane puts this first coat on rather thinly and then sand. A second or even third coat can be necessary depending on the wood. Usually, she prefers the background paint to be thin and well sanded to look like the old pieces, rather than thick and plastic. JoSonja's Wood Stain Glazes can be applied over the background paints to give a translucence to the background. In order to keep the color from changing too much mix it to be just a shade darker than your background. You can add soft texture to this by applying the glaze with a sponge or slip-slapping with a brush. Since the colors Diane uses are Reds and Blues she just adds a touch of Yellow Oxide or darken slightly with Carbon Black to mix the colors. Study the piece for interesting sections that can be painted with a framing or accenting color. Norwegians usually use warm colors (reds, browns or golds) with cool blue or green accents or vice versa. A center panel will often be light in value with a surround of a darker hue such as Tomato Red or Red Iron Oxide. Rosemaling needs framing so keep this in mind when you paint your wooden pieces. Interiors are Off-White such Smoked Pearl, Warm White + tch. Raw Sienna, Primrose 1 part plus White 3 parts is a nice warm light color. Interiors of boxes are usually painted or you can use a couple of coats of JS Sealer, sanding well and wiping with a tack cloth. Most pieces of wood were already old or used when painted. Good matching pieces of wood were not common. Most of the sealants, such as linseed oil or varnishes tended to darken quickly with age. Colorful pieces also enhanced the interiors of the houses which were already quite full of wooden objects. People now have beautiful wooden surfaces to paint on and they rosemal directly on these occasionally. The opinion of most traditional rosemalers, however, leans toward painted backgrounds due to the fact that the grain of the wood fights the fine outline work of the rosemaling and often makes the design hard to see. Most Rosemaling competitions look for painted backgrounds. The background colors of Norwegian rosemaling differ in their intensities particularly after a hundred years. However, the original pieces were usually painted first in a wash of Yellow Oxide or Red Oxide due to their easy availability. Over these colors other transparent glazes could be used. This gives a depth to the piece that is beautiful. You can achieve this same effect by using a light background color such as Primrose thinned with JS Sealer and a little water and then using a glaze such as JoSonja's Red Oxide on top. You can mix the glazes to achieve the color you wish. Remember that these colors should be toned down and not be too brilliant and overcome the rosemaling paint colors. Creativity in your backgrounds make painting unusual pieces much more interesting and fun. With today's acrylic and waterbase paints the sky is the limit. Study old pieces, and, if possible, go to the Museums; Vesterheim in Decorah, Iowa, has photos of old rosemaling for sale. 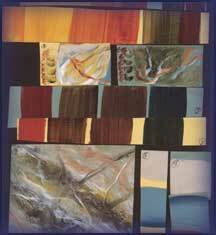 Mixtures on pieces may be different from those below -- this is Diane's usual palette. Set this up using three values of each color. Light--Putty, Soft White 4 parts, Medium Value (as listed above) 1 part, Tch Raw Umber--This is my main outlining color. As the backgrounds get darker so does the value of this color. Follow the color mixes listed for each painted box. IF the colors are different than those above they will be explained. Diane uses this palette for almost everything. When mixing Rosemaling colors remember that oil paints go much further than acrylics and also dry very slowly so they can be kept for several days, even weeks if kept airtight. IF you mix a color that you are going to use a lot of, put some in a small film container for further use.